We travel south of Prague and after about 2 hours, reach our destination – Šumava. There we park our minibus and set out on foot to explore the wonders of this beautiful area. The most delightful parts of the area are part of a protected National Park – not without reason. Boubín Forest forms part of the Park, where centuries-old trees are found. The Bohemian Forest, known in Czech as Šumava, is a low mountain range in Central Europe. Geographically, the mountains extend from the Plzeň Region and South Bohemia in the Czech Republic to Austria and Bavaria in Germany. It creates a natural border between the Czech Republic on one side and Germany and Austria on the other. The most valuable area of the forest is protected in the Šumava National Park and Protected Landscape as well as a UNESCO Biosphere Reserve. It is a popular holiday destination because of the hiking opportunities. There are also many beautiful marked tourist and bike trails. 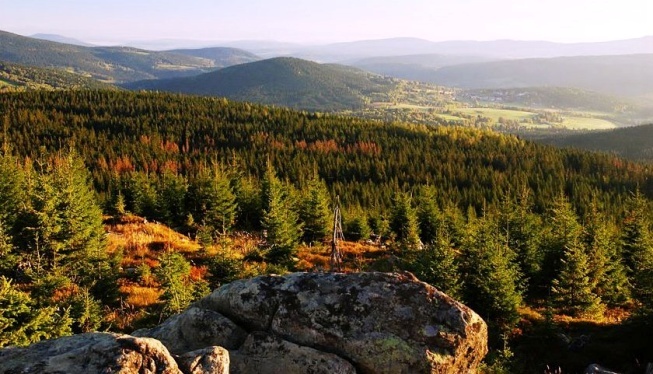 One of the most famous areas in the Bohemian Forest is Boubín Forest. Boubín Forest is a unique reservation in the heart of the Šumava. It is named after the majestic Boubín Mountain (1 362 m above sea level). Some trees here are up to 400 years old, but the forest itself is older than the human race. The area is located in the Šumava Protected Landscape Area. The reason for the protection is the beech-spruce forest with a veneered wedge, forming one of the most important forest sites in Europe. The route is 8.1 kilometres long and runs across Boubín Lake, which was formerly used as a floating tank. The whole trail takes about 3 hours.